Nasa’s plans for an all-female spacewalk have fallen through – at least in part because the agency doesn’t have enough spacesuits that fit the astronauts, the Guardian reports. Early this month, Nasa announced that Christina Koch and Anne McClain would take part in the first-of-its kind mission on 29 March, walking outside the international space station (ISS) to install new batteries. In the past, missions have been all-male or male-female. But in a press release on Monday, Nasa said its plans had changed, “in part” due to a shortage of outerwear. 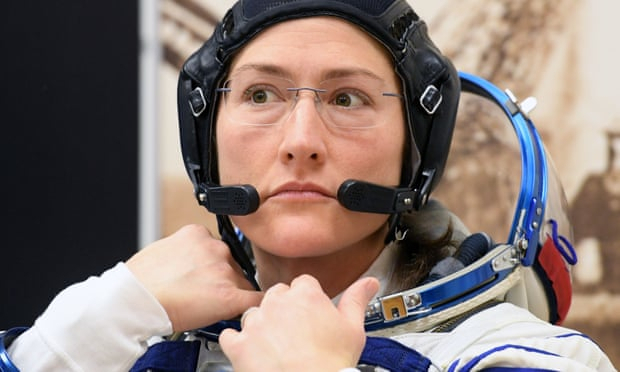 McClain had “learned during her first spacewalk that a medium-size hard upper torso – essentially the shirt of the spacesuit – fits her best.” Only one such top can be made by Friday, the agency said, and it will go to Koch. When McClain took part in a spacewalk last week, she became the 13th woman to do so, Nasa says; Koch will be the 14th. McClain is now “tentatively scheduled” to perform her next one on 8 April. McClain is sharing both ISS missions with men. The first woman to perform a spacewalk was the Soviet cosmonaut Svetlana Savitskaya, 35 years ago. More than 500 people have been into space, but only 11% have been women, Reuters reported. But Koch and McClain were both part of Nasa’s 2013 class, which was half female. Fitting for spacesuits is a tricky business, according to Space.com, since microgravity makes you taller. McClain tweeted this month that she was 2in taller than when she launched.